12′ or taller barn doors – probably a bit large for most shed projects as is, but wow! You can build your own outbuilding with these salvaged pole barn pieces. 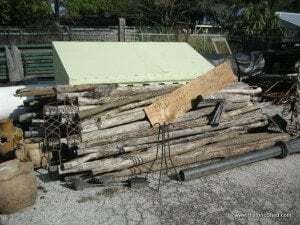 Or use parts for rustic posts inside or out. Salvaged windows in elaborate configurations can be incorporated into a Historic Shed deisng. If one of the larger windows don’t work, there’s bound to be another window you like. We incorporate salvaged wood window sashes like these whenever we can in our sheds. Salvaged Shutter have so many uses from room dividers to actually shuttering openings. Every working shed needs a pulley somewhere. Doorknobs! They make attractive racks for hanging coats, towels or tools. Or check out these 11 ideas for reusing door knobs. Every shed should be well lit – and by more than a bare bulb. Corbels can be incorporated into shed eaves, under window boxes or be used to support shelves inside. Salvaged balustrade for a cozy cottage porch or for a creative reuse project. I did also try to stop by to see Steve at his new shop for Wood Window Makeover across the street, but no luck. It just means I have an excuse to stop by again! I love when someone finds a salvaged door or stained glass window and wants the shed designed around it. I can see why. I bet ideas were flying everywhere for your sheds. I could have spent hours there.